Sam has been to the dentist a few times. Each time she goes, she behaves more wildly than the last. Her checkup a few weeks ago was no exception. She wailed and kicked and screamed, and her flip-flops went flying across the room. Someone had to come help me hold her down! All she had to do was lay down and watch Madagascar, which was playing on TVs all over the ceiling. At this particular visit, she also got X-rays which showed a cavity, which meant a return visit for some very uncomfortable mouth work. I told Sam that her behavior was unacceptable and talked a lot about the upcoming trip back to the dentist. Well, we went back this morning, and she did great! She got to watch Rio on the TVs this time and color on a lap desk. She was pretty loopy afterwards and I had to carry her back to the house. 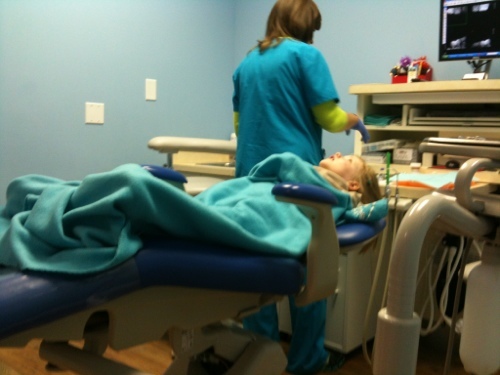 She asked “Why is my head so heavy?” and “Why did we come to the dentist?” among other silly questions. She had an ice pop and a couple of juice boxes while recovering. She was very concerned that she left her unfinished juice box at the office when we left. I also confirmed that she has an extra tooth, which is why her bottom teeth are so crowded (and contributed to the cavity)! Who knew?! We will continue to work on flossing (ugh) so that maybe we won’t have to go through that again.